On the Waterfront (1954) introduced Method acting into the mainstream and Marlon Brando’s moody, muscular performance ushered in a new wave of actors that included the likes of James Dean and Montgomery Clift – thespians that immersed themselves completely in the roles they played. At the heart of director Elia Kazan’s masterpiece lays a deeply conflicted protagonist torn between the loyalties to his brother and doing what he knows is right. Shot on location on the gritty New York City streets (and Hoboken, New Jersey docks), On the Waterfront helped popularize a kind of kitchen sink realism that placed you right in the lives of these characters and the world they inhabited. Not-too bright boxer-now longshoreman Terry Malloy (Brando) helps mob-linked union boss Johnny Friendly (Cobb) send a fellow dock worker to his death when he won’t cooperate. It doesn’t sit well with Terry, especially when he befriends the dead man’s sister Edie (Saint) who wants to find the person responsible. Terry is torn between his loyalty to his brother Charley (Steiger), who is Johnny’s right-hand man, and a local clergyman (Malden) determined to convince him to do the right thing. Kazan populated On the Waterfront with an impressive collection of New York stage and television actors who really tapped into the slice of life approach that the director was going for, from Brando on down. The film features an embarrassment of riches in terms of acting talent with the likes of Karl Malden, Lee J. Cobb, Rod Steiger, and Eva Marie Saint. While their performances seem mannered by today’s standards, in the 1950s they reflected the way people acted and behaved. The performances they deliver and the way they play off each other is one of the reasons this film is considered a masterpiece. 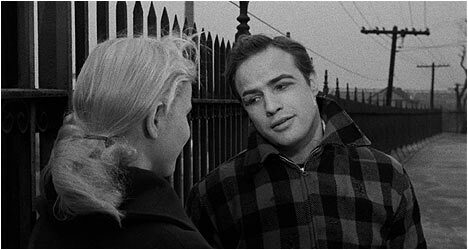 With its use of actual locations and authentic-sounding dialogue, On the Waterfront is a fascinating snapshot of mid-‘50s New York. Kazan drops us right in the middle of this hard-nosed, blue collar neighborhood and depicts their struggles by showing how work down at the docks operates, including the corrupting influence of the mob, which makes it so that some men get a day’s work while others don’t. On the Waterfront took Hollywood movies out of the studio back-lot and into the real world in an attempt to strive for a certain level of authenticity. In On the Waterfront, one man can make a difference as Terry does by standing up to the mob. He’s willing to put everything on the line and risk it all for the love of a woman who helps him find his conscience. It’s hard not to get caught up in the film’s righteous anger against corruption and greed. Kazan doesn’t shy away from the complexity of Terry’s dilemma, showing how things are never black and white but somewhere in-between. It’s a valuable lesson that Terry learns and one in which gives On the Waterfront a timeless quality. The first disc features an audio commentary by Richard Schickel, author of Elia Kazan: A Biography, and Jeff Young, author of Kazan: The Master Director Discusses His Films. Schickel gives us the backstory to the project – something that Kazan had wanted to do for years. The film critic argues that this film features Marlon Brando’s best performance while Young talks about Kazan’s choice to shoot on location. Both men interviewed the director for their books and recount some of his thoughts on the film. Martin Scorsese and film critic Kent Jones talk about the film, starting things off by point out the influence of Italian neo-realism. Scorsese talks about the film’s influence on him growing up – i.e. how the characters reminded him of people he knew. The director is his usual charming self as he displays an impressive knowledge of that era of cinema. “Elia Kazan: An Outsider” is an hour-long documentary from 1982 that examines the career of this famous director. It’s a good primer for those unfamiliar with his work. He talks about his relationship with the Actors Studio in New York City, which he helped create, and, of course, discusses On the Waterfront. There is also footage of Kazan revisiting the docks location used in the film, which are now derelict. “On the Aspect Ratio” is a brief featurette explaining the multiple aspect ratios of the film. This box set allows you to watch the film in either 1.33:1, 1.66:1 or 1.85:1 and this extra explains the differences between each of them. The second disc includes a retrospective documentary entitled, “I’m Standin’ Over Here Now,” which features various film scholars sounding off on the brilliance of On the Waterfront. They start off by providing a brief biographical sketch of Kazan, leading up to the film. These pundits soon provide the origins to the film and recount several filming anecdotes in this informative featurette. There is an interview with actress Eva Marie Saint. She had done plenty of theater and T.V., but On the Waterfront was her first film. She offers her initial impressions of Brando and what it was like to act with him. Saint also recounts working with Kazan in this engaging extra. Also included is an interview with Kazan that was conducted in 2001. He talks about making On the Waterfront and recounts details that were included in previous extras. There is an interview with Thomas Hanley who appears in the film as Terry’s young friend. He was a non-actor and afterwards went on to become a longshoreman for the rest of his life. He recounts how he got the gig in this refreshingly candid featurette. The third and final disc starts off with “Who is Mr. Big? : James T. Fisher on the History of the Waterfront.” The author talks about the historical background to the film and how the Irish immigrants helped build the port of New York. In this fascinating extra, he talks about how the ports worked and how this informed the events in the film. “Contender: Mastering the Method” examines the famous taxi cab scene between Marlon Brando and Rod Steiger and how their Method acting technique informed it. Steiger talks about how he got the role and what it was like doing the scene. Finally, there is a video essay examining Leonard Bernstein’s score for On the Waterfront. It was the only one he ever composed and initially he turned the job down. This is an excellent analysis of the film’s music and how it complimented what we are watching.